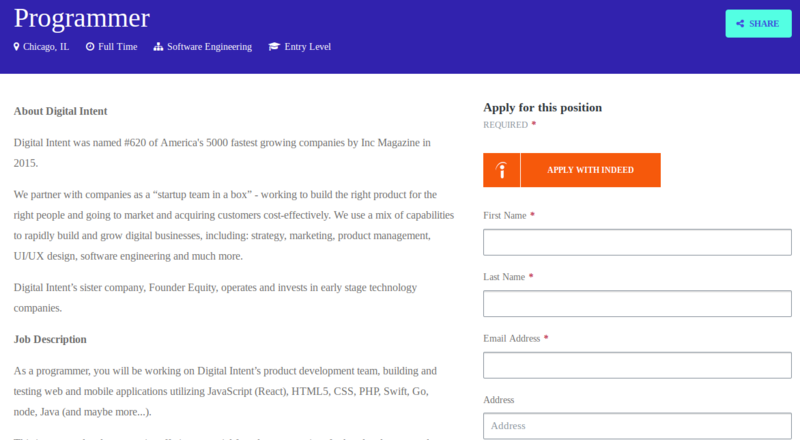 Indeed.com, known for free job ads, offers businesses two additional free features: Indeed Company Pages and Indeed Career Pages. Both can help you find employees and improve your employer brand. We’ll explain how to claim your Indeed Company Page and add an Indeed Career Page to maximize your business recruiting efforts. We use Indeed regularly for new job postings, and we’ve consistently found and hired quality talent via its job board. In fact, Indeed.com is the largest online job board with over 250 million users and 100 million searchable resumes. If this is your first time hiring with Indeed, get a free $50 ad credit to boost your job postings. What Is an Indeed Company Page? An Indeed company page is a profile of your business that job seekers can use to research your company as a potential employer. Current and former employees, as well as interviewees, can leave reviews on your company page. 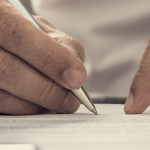 Employers can “claim” their page in order to respond to reviews and monitor postings. Fit Small Business’ company page on Indeed. Notice that it’s been claimed. In fact, your Indeed company page may already exist. To find out, do an internet search for your business name followed by the word “Indeed.” You may find online reviews that have been written by current or former employees. Example of a search to see if there’s already an Indeed company page. What Is an Indeed Career Page? Indeed career pages allow businesses to create a page on their own business website for job seekers. Any jobs you post on Indeed are then listed on your website as well. That allows applicants to search job openings and submit their resume—all without leaving your business website. Indeed makes it easy to set up a careers page on your company website without the need for a web developer. 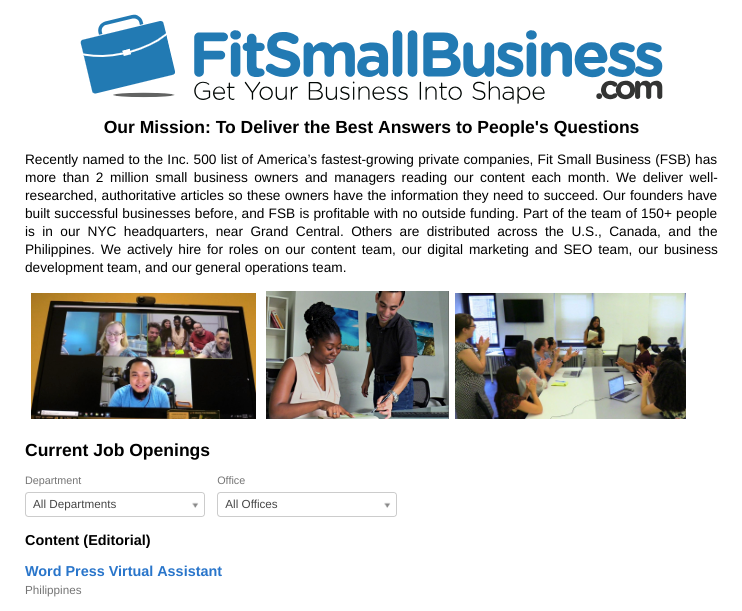 Here’s an example of Fit Small Business Indeed careers page. There are two ways to claim your Indeed company page. By claiming your Indeed company page, you’ll be able to respond to those reviews and customize how you’re presented to potential applicants. That allows you to project a positive brand image to candidates. Example of searching your company name on Indeed’s website. Image showing how to claim your Indeed company page. 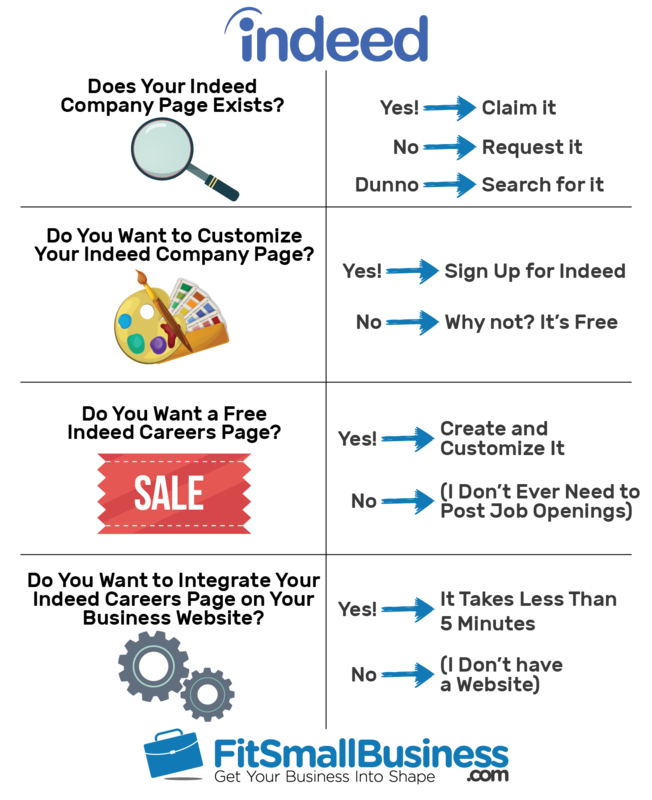 Image showing where to submit your request to create a company page. The request form has drop-down options so that you can submit your request to have a company page set up as shown below. Once that’s done, you can claim it. Request to set up an Indeed company page for your business. Before you can customize your Indeed company page, you have to sign up on Indeed. It’s easy and doesn’t require a credit card. You register by providing your email address and a password. Or, you can sign up by using your Google or Facebook account, if you prefer. When you sign up for your free account on Indeed, you’ll first be prompted to post a free job ad. While you may not be interested in posting one just yet, you’ll need to do so before you can edit your company page. Chose the Employers/Post job option to post a job on Indeed for free. Consider creating a quick job ad for your most common open job role. You can always go back and edit it later. Once you’ve done that, the final step to setting up your employer account is to confirm your email address. Consider customizing your Indeed company page so that it’s consistent with your company brand. You can add text, photos, and video to give potential job seekers a sense of what it’s like to work at your company. You can also customize the header image and the logo on your Indeed company page. You also even add information about your CEO (complete with their headshot) and link to your company’s social media pages on Facebook, Twitter, and Instagram. 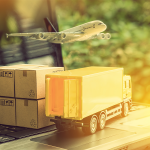 From your company page, under the “Why Join Us” tab, you’ll find options to add a header image, add your company logo, modify the company description and details, and integrate with social media. Indeed offers free courses as part of their Indeed Academy to help. In fact, all these customizations are free. Once your page is set up, you can then respond to reviews from current and former employees through an Indeed-regulated process. You’ll then be alerted to new reviews as they are posted. If you want to get more mileage with your company page, you can sign up for Indeed Company Page Premium. That allows you to advertise a job, feature a review, make your “Why Join Us” tab visible on a mobile app, and view in-depth analytics. If you’re growing fast and want to improve your employment brand to attract talent, consider this upgrade—it’s priced based on your average job posting volume. To sign up, you’ll need to contact Indeed’s sales team. Just click a button to set up your Indeed career page. It’s noteworthy that, unlike your company page, the career page is not Indeed-branded; it is integrated with your own website. It will look to job seekers like you had a web developer customize it for your business. Job seekers can apply to your Indeed-hosted job postings right from your business website. Just follow the prompts in the text-based form and upload your company logo as well. You can see what the customized URL will look like as your careers’ page web address (see top right in image below), and you will be able to link it to your social media accounts if you want. Example of career page customization with URL shown at upper right. There are several ways to integrate your new Indeed Careers Page with your existing business website depending on the web hosting service you use. Regardless of the method, it should take you no more than five minutes to set up the link. Inline frame (iFrame): Indeed provides an iFrame you can easily integrate (no web development skills required); if you need help, contact Indeed’s customer service. WordPress: WordPress provides a plug-in that you can use to integrate your new Indeed careers page. Application programming interface (API): Indeed provides APIs to assist with connecting job seekers to your careers page and let them apply from your website. Other websites: If you use other web development or hosting service, you can cut and paste the careers page HTML code directly into your website. 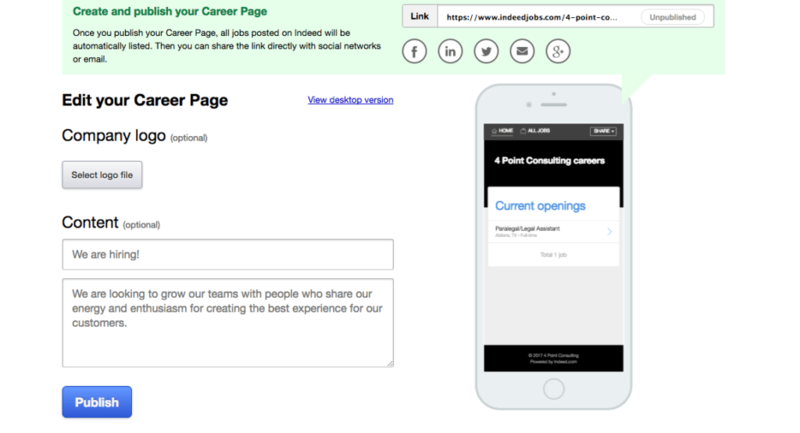 Once complete, your Indeed careers page will look like it’s part of your existing website. 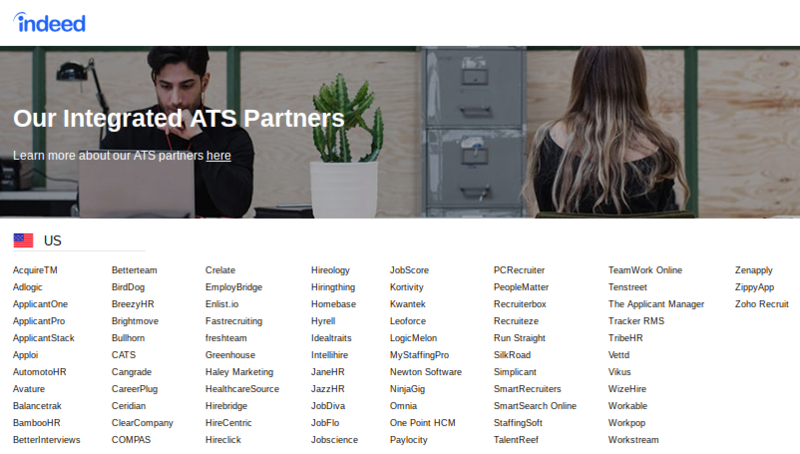 In fact, if you’re using an applicant tracking system (ATS), Indeed offers direct integration. Here’s an image showing the ATS they integrate with in the U.S. Indeed integrates with the most popular U.S.-based ATS and many international ones too. Freshteam is an applicant tracking system that offers a free plan for businesses with fewer than 50 employees. It lets you track jobs posted on Indeed (or you can post them on Freshteam and push them to Indeed and other job boards.) Best of all, you’ll have access to view which job boards are providing you the best job candidates. Get a free 21-day trail. Once you’ve claimed your Indeed company page and created a link to your website, any job you post on Indeed will automatically appear on your careers page. You can also log in and monitor applications using Indeed’s free, built-in ATS, just as you would with any Indeed job posting or sponsored job ad. Understanding more about how Indeed works may help as you strive to attract talent to your small business. Indeed is the largest job board, and it’s free to applicants. As a business, you can post as many free jobs as you like. If free job posts don’t serve up the number and quality of job applicants you seek, you can sponsor your jobs for as little as $5 per day to get them to pop up to the top of job seeker search results. You only pay when applicants click on your job. Because so many job seekers look for employment on Indeed, it’s smart to claim and customize your free company-branded page. Here are additional reasons it makes sense to use Indeed in the first place. One of the key features behind company and career pages is that they are completely free, just like Indeed’s free job postings. In making this service free, Indeed allows all small business owners to create a more comprehensive hiring experience. 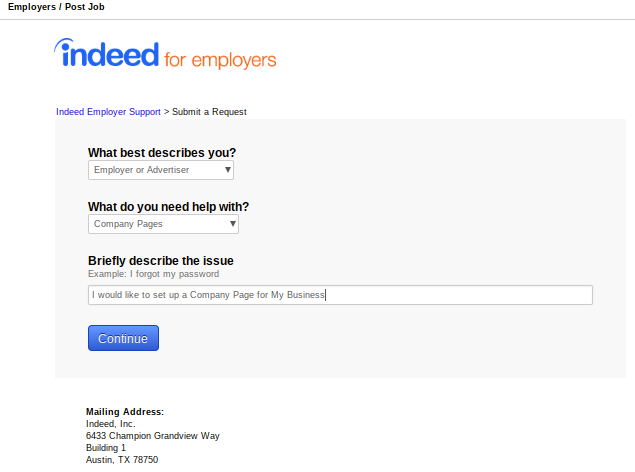 Indeed gives job seekers a heads-up on the companies they’re applying to. Once your careers page has been set up, you can start posting jobs that will be seen on Indeed automatically. This makes your life a little bit easier; your job openings will be posted on your website plus on Indeed, and you won’t need to use two different systems (a job board and recruiting software). The Indeed careers page helps you to expand your web presence for free. When people search for your business, your career page will show up along with your website. It’s helpful to potential applicants and leaves a more professional impression to customers, partners, and competitors. Tying into web presence, your Indeed careers page will also integrate with your social media accounts, making it easy to let your network know about open positions and to encourage employee referrals. The factors above, combined with Indeed’s ATS functionality, make an Indeed careers page a one-stop recruitment shop. You can track your job posting performance, determine which applicants need to be scheduled for interviews, and more. Below are common questions small business owners ask about using Indeed and setting up Indeed company and career pages. Indeed also provides an Employer Help Center that you may find helpful. But, if you can’t find your answer, feel free to post it in our forum. Our HR experts will do their best to get back to you in a day or so. Why does Indeed set up company pages without employer input? Indeed will set up a company page if you post a job, sponsor a job, or whenever a job candidate or someone from your company submits an online review of your business. The reason is that Indeed wants to give candidates a heads-up on businesses they submit applications to. It’s a service meant to support their millions of monthly job seekers. Yes. Indeed is free to job seekers. 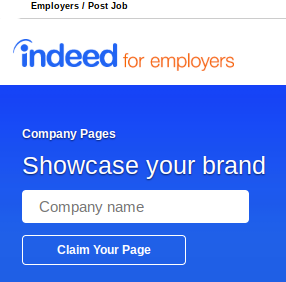 Indeed is also free to businesses that want to post jobs, claim their company page, or create a careers page. Indeed earns revenue, nonetheless. It does so by providing other services, such as premium services to employers like paid job ad sponsorships, to boost job posting results. Can employers pay to have a bad review removed? No. A business cannot pay to have a review removed. A business is free to respond to a review or to report a false review, but they can’t pay to have a review removed just because they don’t like it or don’t agree with it. How do I edit my Indeed company page? Before you can edit your Indeed company page, you need to create an Indeed account. It’s free. 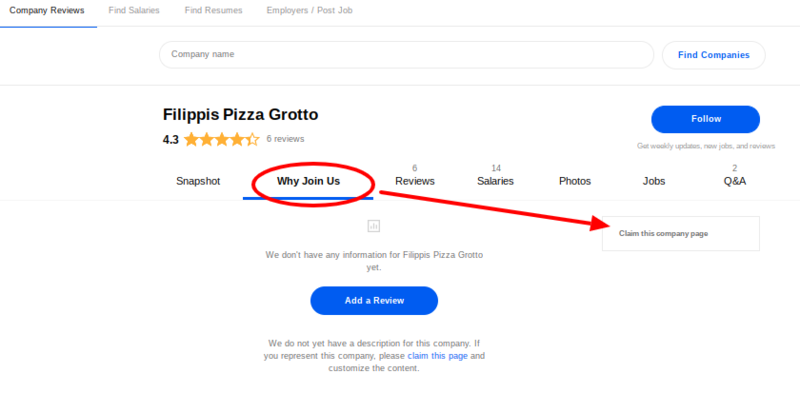 Once you create your Indeed account, you can claim your company page by using the tab marked “Why Join Us.” Once you’ve claimed your page, you can edit it. All that is free. How many job seekers are on Indeed? Employers can find over 100 million resumes on Indeed. In addition, Indeed sports 250 million unique visitors each month. As the largest U.S. online job board, it’s likely that the job seeker you’re looking for has already established a free profile on Indeed. Can I view resumes on Indeed? Indeed offers a resume search feature for free, but there’s a catch. You aren’t able to see the job seeker’s contact information or reach out to them through Indeed unless you pay at least $100 per month for that premium paid service. Here’s more on Indeed resume search, how it works, and what it costs to contact job seekers. How can I post a job on Indeed? It’s easy to post a job on Indeed. On the Indeed website, choose the “Employers/Post Job” tab, and choose the “Post Job button.” Indeed then walks you through a step-by-step process to post the job for free, or to set a pay-per-click advertising budget for as little as $5 per day. How can I advertise a job on Indeed? Posting a job is free. If you want to advertise that job so that it is visible to more job seekers, Indeed offers what they call “Sponsor a Job.” It’s a pay-per-click advertising method that allows you to set a daily budget. Since advertising a job is likely to result in more and better job candidates, it’s a great way to fill your open jobs quickly. Here’s more on how to advertise a job. Are there other free job boards like Indeed? Yes, there are many free job posting sites, but Indeed is the largest. Further, they’re not exactly like Indeed, as Indeed includes a free ATS system and provides you with free company and careers pages. Nonetheless, to maximize your chances of finding the right candidate, consider cross-posting your jobs on these other free job boards. Having both a claimed Indeed company page and an Indeed careers page will do nothing but help your business from both a reputation management and recruitment standpoint. Each process takes five minutes or less, and they are both free. Consider signing up for Indeed to see whether it works to improve recruiting and hiring for your small business. 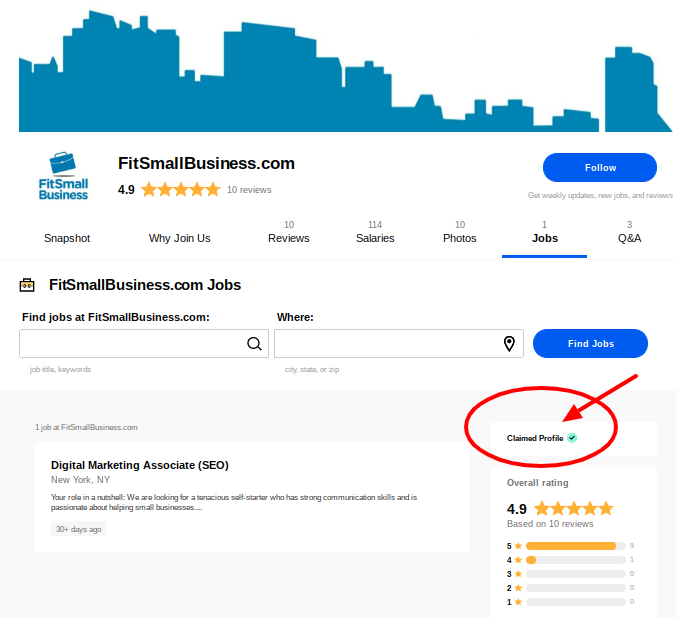 We recommend Indeed as the best job board for small businesses since they connect you with the most qualified candidates for the lowest price. Indeed is also the job board of choice when we recruit at Fit Small Business. Click here to get started with a $50 free advertising credit.